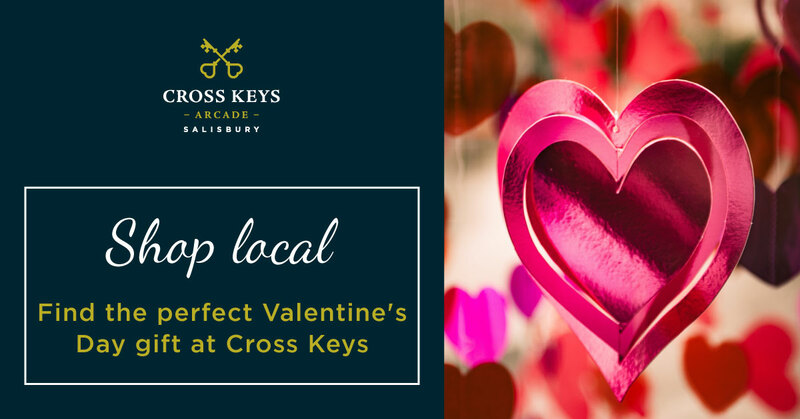 Valentine’s Day is just around the corner so we’ve picked out our favourite gifts and experiences from Cross Keys Salisbury retailers to help you create the perfect Valentine’s Day. There’s no excuse not to get a card for your loved one with a great choice at Rymans, TK Maxx and Goodfayre. Listen to a love song with classics available at Vinyl Collectors and Sellers. Choose from Lionel Richie, Chris de Burgh, Frank Sinatra and many more… maybe a song from the year you met or that song you played on your wedding day. Gallery 21 have some timely heart inspired pieces in stock this week. Relax and smell delicious with bath bombs and bespoke fragrances from Scent & Colour. Get your hair done at Blinkers or Eden Hair of Salisbury. If you don’t fancy cooking, treat the one you love by booking a table at Wildwood. If you’re whisking someone away on a romantic break be sure to drop by Eurochange for foreign currency. Got that loving feeling? Visit Cross Keys… and show someone you care!